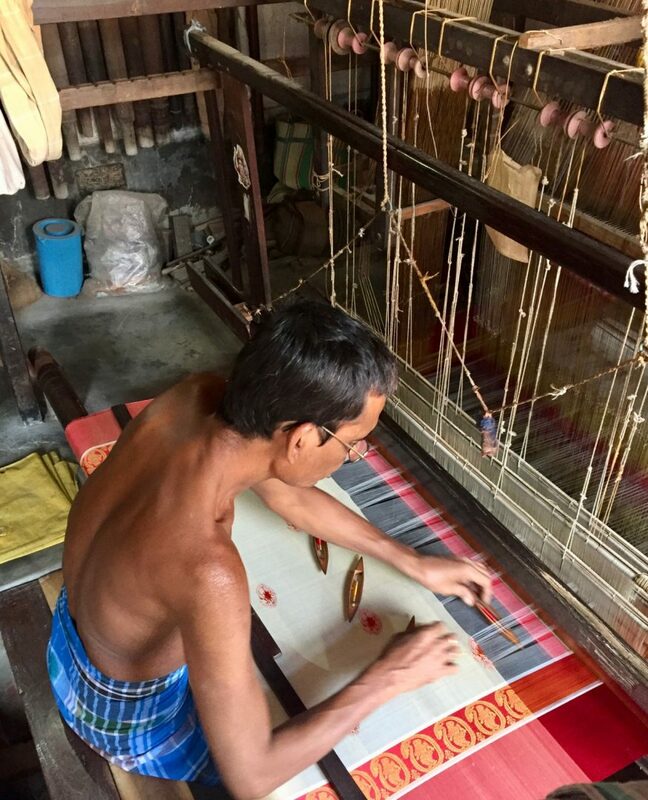 The Silk River scrolls are made from 100% high quality, hand-woven, silk from Murshidabad. This same remarkable silk is now available in the UK to buy in limited amounts. Please enquire on sales@kinetika.co.uk for further information. 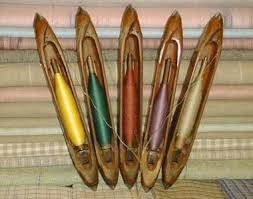 Various accounts of the history of silk in India claim that silk weaving in Bengal existed from ancient times. Records show that the silk weavers of Murshidabad were operating in 18th century when Nawab Murshid Quli Khan shifted the capital of the Dewanee of Bengal from Dhaka, now in Bangladesh, to a new capital he built on the east bank of the River Bhagirathi and named Murshidabad. Murshidabad is famous for its cowdial saris made of fine mulberry silk with flat, deep- red or maroon borders made with three shuttles. The borders are laced with fine serrated design in gold zari. 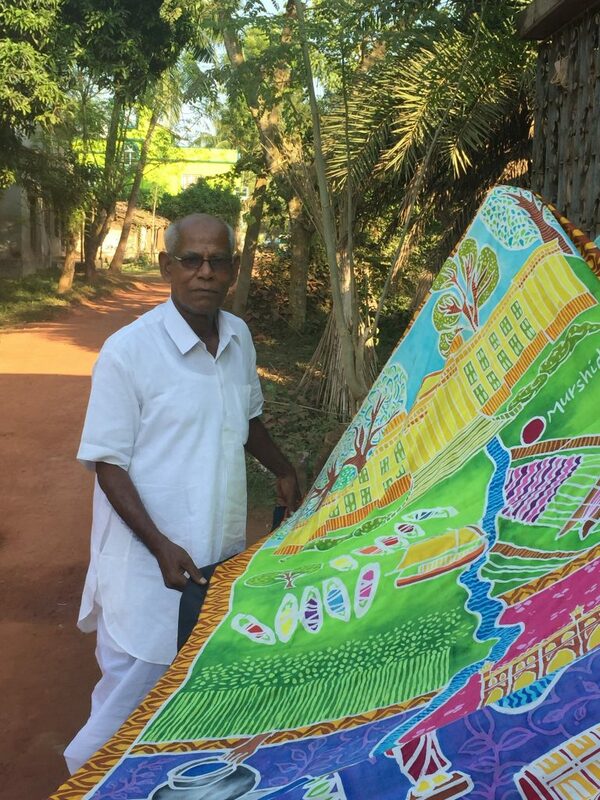 Murshidabad silks are also popular for hand-printed designs and other materials which are also printed with wooden blocks. 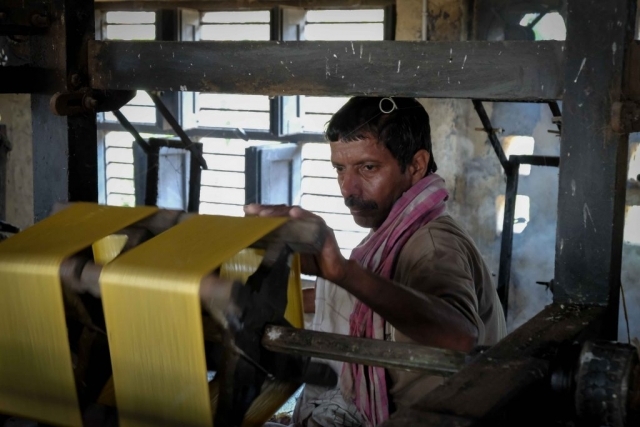 Calcutta and Serampore in the Hooghly district are the main textile hand-printing centres in West Bengal. Camera and production by Korak Ghosh, Joydeep Bhowmick and Mike Johnston. The cultivation of mulberry silk and its weaving is carried out in the plains of West Bengal. 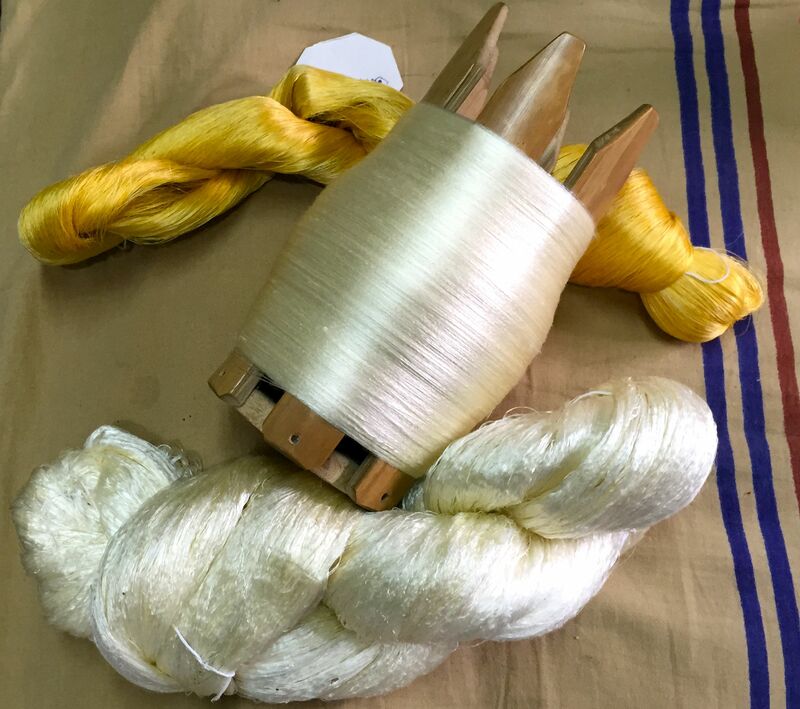 The districts where silk yarn is made are Murshidabad, Birbhum, Bankura, Maldah and Purulia districts. 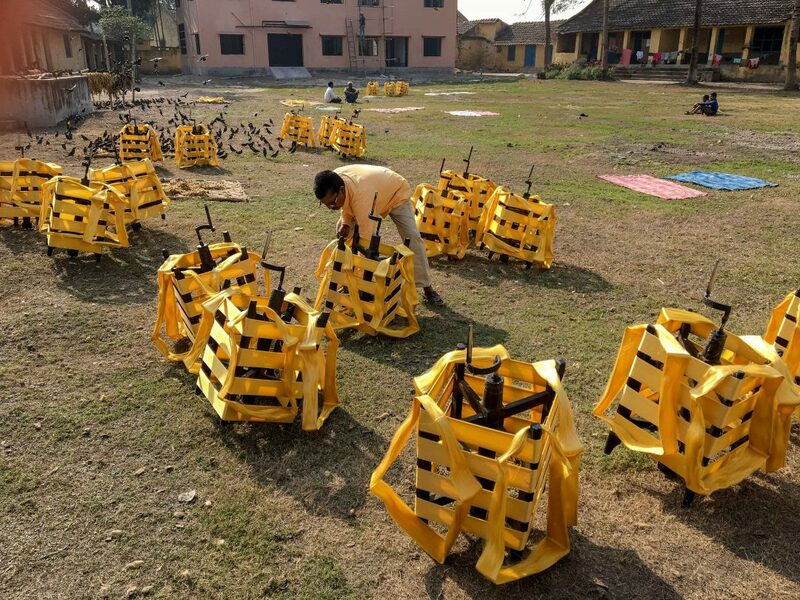 The district of Maldah on the north bank of the Ganga is today the most important centre for silk rearing in West Bengal. 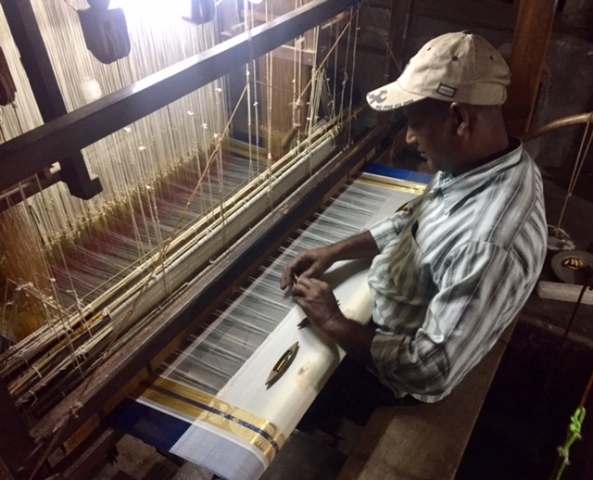 The quality and texture of the Murshidabad silk that serves as the material for the Silk River Scrolls, is the story of how Crafts Council West Bengal supports artisans, ensuring that the weaver is appropriately paid and can respond to meet the demand of a global world. Once famous for the heavy, durable but amazingly supple silk that was worn by the Moghul nobility and exported across the world by local merchants working through an astonishing network of traders and relationships who sold in the South East Asian markets in the early 18th century, Murshidabad silk travelled to Europe because first the French and then the British East India Company exported it. It declined as did the city of its origin, when the capital shifted to Kolkata. 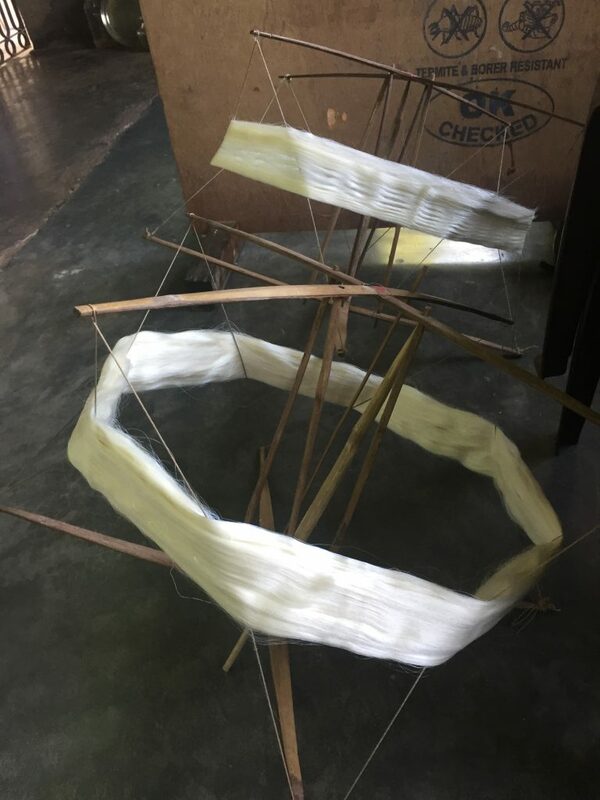 The weavers struggled to protect their skill and the trade by downgrading the quality of the fabric, which then became synonymous with light, fine less expensive silk, best used for printing. 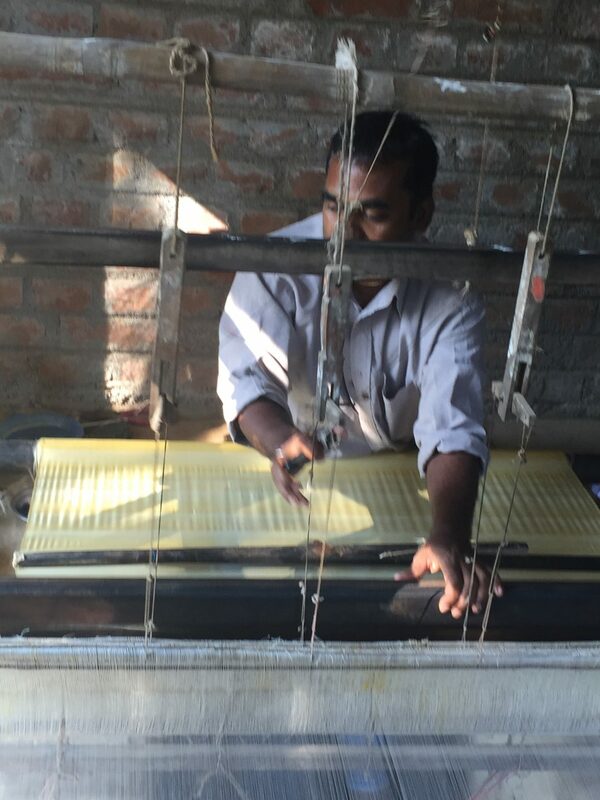 The skill of producing the heavy silk cloth – Dotari/teentari was preserved, but there was very little demand. 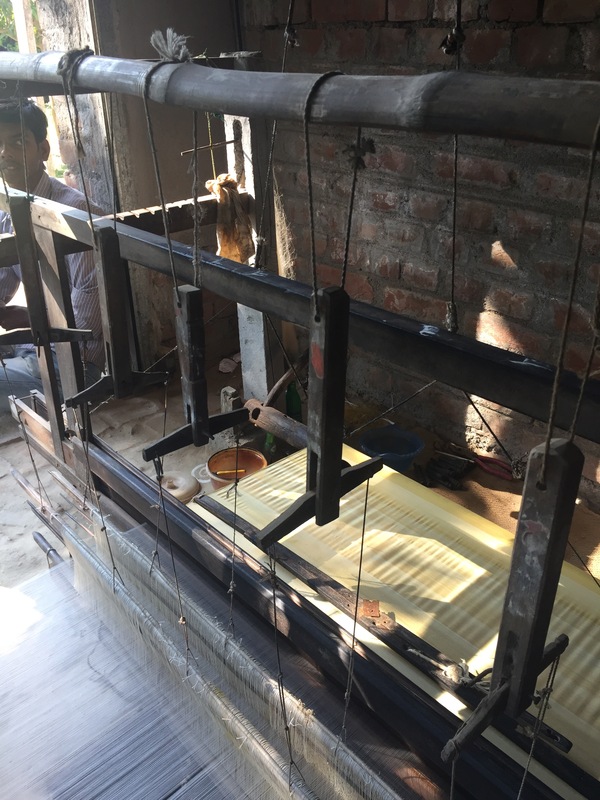 Ali Pretty heard about this story and wanted to find out if it was possible to use Murshidabad silk for the scrolls and director of CCWB, Ruby Palchoudhuri, offered to find silk of appropriate quality to match the story of Silk River. 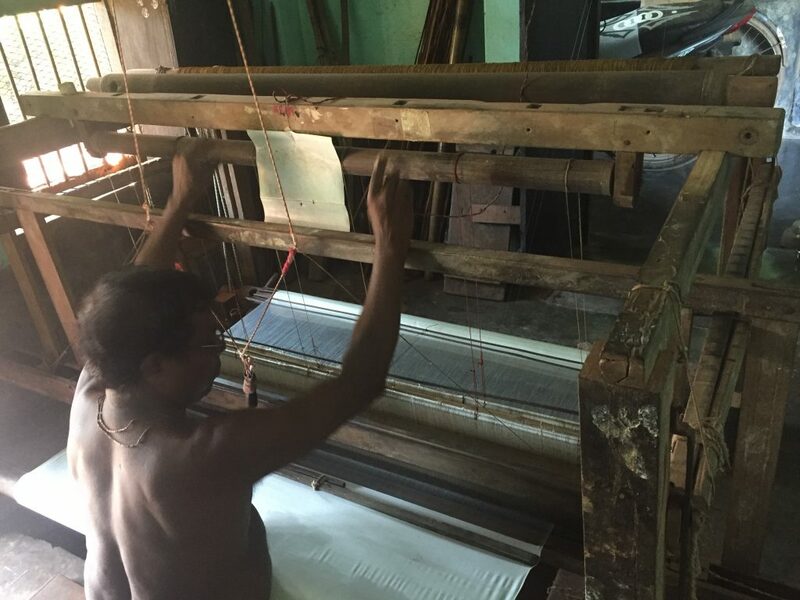 It has turned out to be a great revival project as the weavers were contacted, convinced through a series of negotiations that it would be a wonderful opportunity to recreate the superior quality silk on a pilot basis for an international project. 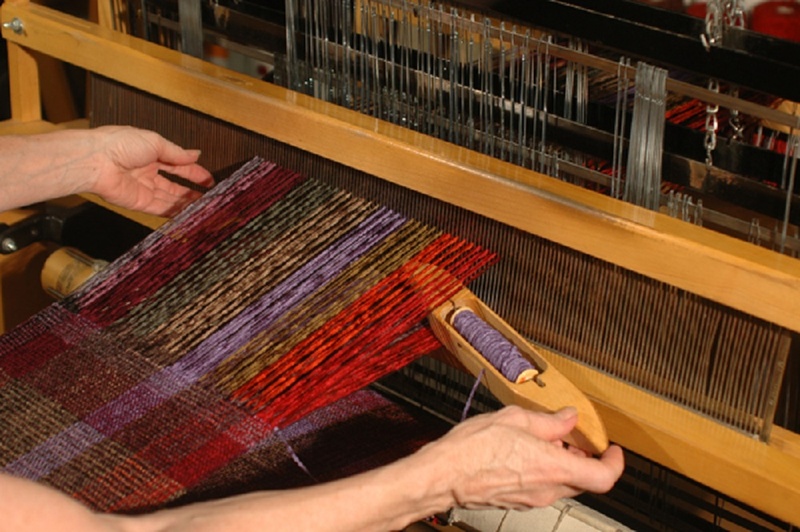 The weavers rose to the challenge and the silk for the scrolls was woven on looms that had not done so in recent memory. CCWB’s role as intermediary ensured that the silk was pure Murshidabad and not mixed with yarn from other parts of India or indeed the world. 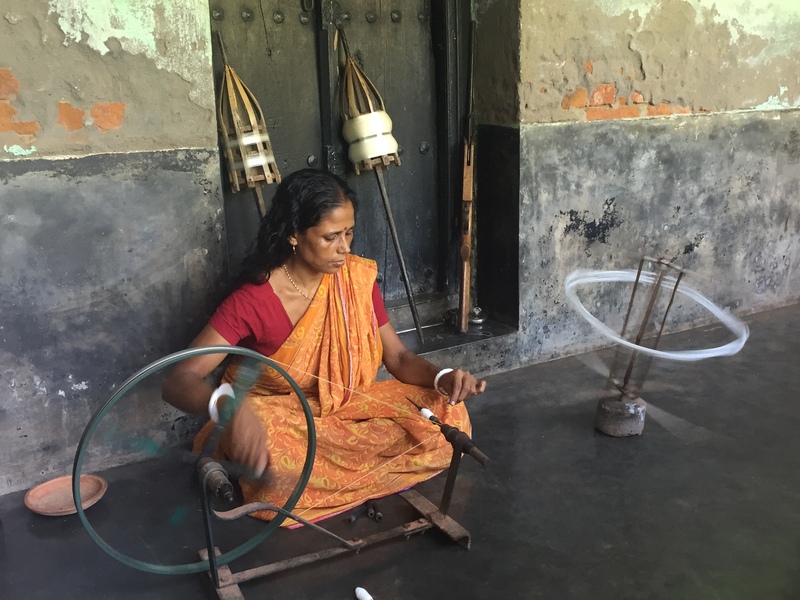 The success of the scrolls in telling the story of the British connection to India, from the past to the present will restore Murshidabad’s place in the history of Empire – as a centre of trade and a producer of exquisite silk. 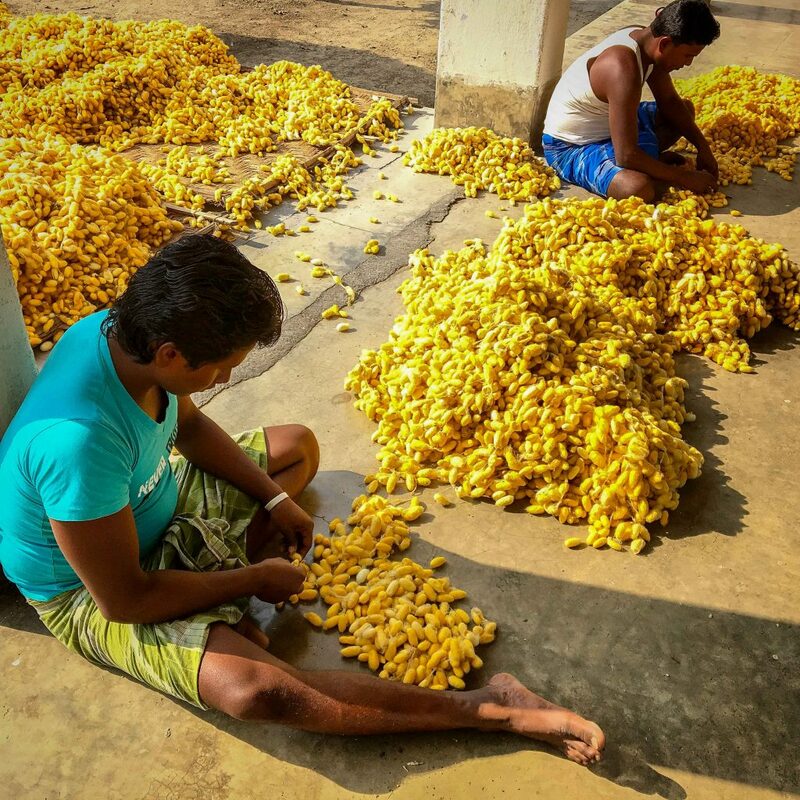 The Historical decline of the Silk Trade in Murshidabad. By 1772 the English merchants were dominating and the East India Company was the triumphant foreign trader. They fully controlled the trade and commerce. The French, the Dutch, the Danes, the Armenians and other foreign traders were only waiting to be fully eliminated from the East Indian scene. The prosperity of the English traders was also a signal to disaster for certain commodities like the silk. Encouraged by the interest of the English Company the Pykars (wholesalers) went on increasing the price of silk which were greatly in demand. This inordinate greed ultimately killed the silk trade of Bengal. First it became cheap to manufacture silk cloth in Manchester and then it became a better business to import Italian silk to India. The English factory of Surat which kept an account of the silk bales imported from Bengal for export to England show the great decline. The social economy of Bengal became quite different from what it had been previously and the emerging of a new age centred around the English administrators in Calcutta was evident.